Somehow I thought that doubling our income would solve our irregular expenses problems, but I guess I was wrong! Our targeted savings accounts were our budgetary saviors during grad school. Our income was pretty low, so irregular expenses like plane tickets and car repairs would have totally overwhelmed our available cash flow in a given month. Our targeted savings account converted large irregular expenses to small regular expenses and helped us plan, save, and make spending decisions. This month is the first one in over a year that we’ve set up a line item budget for ourselves. Our last budget before this was my last month as a graduate assistant at the end of summer 2014. That was the month that we disbanded the targeted savings accounts we had used in grad school because we were embarking on a year of irregular income and expenses. So we were sort of flying by the seat of our pants this past year, drawing down our cash savings to be able to keep saving for retirement despite our low and fluctuating income. Anyway, when we decided to move to Seattle I picked a price range for our rent that would be reasonable on Kyle’s new income alone, and with that “big rock” taken care of (and no commuting costs!) I felt confident that our budget would be well under control. And the first draft of our budget was promising. After accounting for all of our saving goals and regular fixed and variable expenses, including a nice increase in expected spending due to the higher cost of living and a little lifestyle increase, we still had several hundred dollars of unallocated cash flow each month. Then, I decided to take a stab at predicting our irregular expenses – just to make sure we were going to be able to cash flow everything with no issues. That brought reality crashing back in! Across just five categories – Cars, Travel, Gifts, Appearance, and Electronics – I predicted we would spend almost $12,000 over the next year! Not only was all of our unallocated cash flow eaten up, but we chose to scale back our savings goals from aggressive to normal-for-us to make our budget balance. Those three items together are predicted to cost $4,800! What they have in common is that they all represent delayed gratification from grad school. I’ve been telling Kyle for over two years that he could buy a new desktop when he got a job. I’m getting to be slightly overdue for a new laptop time-wise, and my current one is signaling that it’s getting close to pooping out. And we still haven’t taken a trip/vacation with a destination of our choosing since our honeymoon! (As wonderful as our cross-country trip was this summer, its primary purpose was moving our car.) Maybe that planned spending could be considered lifestyle inflation, but I think for us it is a reasonable lifestyle increase. After realizing that our irregular expenses were likely to take up almost $1,000 per month on average, we decided to re-implement a version of our targeted savings accounts. We won’t have literal separate accounts this time around, but rather let our checking account balance rise and fall (we started keeping a large buffer in it a few months ago) while manually tracking the irregular expenses in the five categories I mentioned to make sure our predictions were reasonable. I hope that we will have over-estimated our spending in these categories so that we can end up transferring some extra money into savings. In our monthly budget review posts up through September 2014, I reported transfers in and out of our individual targeted savings accounts. Starting this month, I’ll just list a dollar figure of how much we spent in the targeted savings categories against the average expected over the course of this year. It turns out that increasing your income doesn’t solve all your money problems – especially when your expenses increase in turn! It looks like we won’t get away from the intensive budgeting habit anytime soon. How to do handle irregular expenses in your budget? What was the last delayed gratification purchase you made? 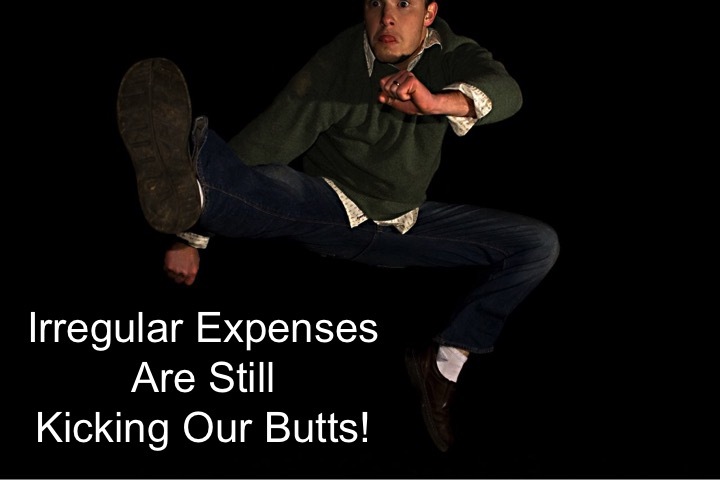 26 Responses to "Irregular Expenses Are Still Kicking Our Butts!" I’ve been cash flowing my irregular expenses (so far they haven’t been big enough to cause problems). I only end up with $3-4k in my checking account most of the time. But I can dip into checking accounts that I have open for signup bonuses (I’d have to pay the monthly maintenance fee on the account, but that’s much cheaper than say, carrying a cc balance). Or I could just sell some of my investments in my taxable account. Your monthly nut must be quite low to be able to cash flow your irregular expenses – great job! Yup. Honestly, almost every expense of mine other than my mortgage and HOA dues are irregular. I’m considering not budgeting next year (but still tracking my spending) and just transferring this year’s average monthly spending to my checking account each month. My overall annual spending is reasonably similar each year, so that seems like a doable goal. For the last several years though, I use a spreadsheet I made that is like YNAB to track my budget. Maybe you guys should consider trying YNAB? That sounds like a good system since you’re in such a groove with your expenses! I think it would take us a couple years in the same city at least to get to that point. I have been considering YNAB or Mvelopes, but the switching costs of leaving Mint (6 years of data…) are pretty high! I still like Mint for our monthly expenses, though (fixed or variable), which is mostly what I want to pay attention to. My hubby and I save up for large irregular expenses, but there always seems to be some that we forget about and end up paying for out of our monthly budget. When that happens we usually have to increase our total spending for that month because there’s not much we can cut out to make up the difference. Luckily our income fluctuates too and I can take on extra work during the months with higher expenses to help make up the difference. Being able to work/earn more in response to high expenses is definitely an upside of variable income! We also cash flow them. And… they’ve gotten to be kind of predictable. I don’t know what the big expense is going to be, but the amounts have pretty much stabilized over a 3 month period. There’s also some weird predictability like the same months tend to be super expensive or super inexpensive. Not always, but enough. We haven’t always cash flowed them, but we have always had enough in our slush fund to handle them. That’s great that your irregular expenses are so regular (over each quarter) now! I haven’t really mapped them out for our budget to see what the cycles are. Like nicoleandmaggie, we cash flow them and concur that they largely become predictable, though in the beginning of our marriage we didn’t have an income/savings rate combination that allowed us to do that, so we just paid them out of our cash buffer, which we keep significantly higher than you guys. Zero-ing out checking accounts (or even coming close to that) is not something we’ve ever been comfortable with, though I’d be lying if I said using the cash buffer was a low-stress event. Irregular expenses are much less stressful (as in mostly not stressful at all) now that our income/savings rate combo lets us cash flow them. I couldn’t imagine zero’ing out my checking account either. There’s always some sort of buffer in there. Right now, it should only have $2k in there but there’s a credit card statement that won’t be paid until mid-November, so there’s actually $4k. I’ll never use the float, but it’s reassuring and allows me to leave things on auto pilot. Note: We always had a buffer in our checking account, it was just a time buffer (1-2 paychecks deposited before the end of the month and not used until the beginning of the month) rather than a specific amount of money. We have switched to keeping a buffer in our checking account of about $4k. We didn’t want to risk anything going wrong during our move. We’re just overall being looser with our budgeting methods now that our income is higher. Essentially we are now cash flowing the irregular expenses, but they are still high relative to our available cash each month! When you say you set expectations for spending for the year, what actually changes based on the expectation? Your long-term savings rate? I think we’ve adjusted our retirement savings rate slightly down (20% to 18%) but the rest would have gone to cash savings anyway so nothing really changed. I use a “short term savings” account, which is basically just unallocated cash buffer. I used to do detailed budgets and pre-allocate that cash, but lately I (pretty easily) just think about what is coming up in the next 6 months to a year, and know when that has plenty. When it gets too big, I allocate some to savings. Which… after I wrote this down, I realize is actually a horrible way to do personal finance, at least for beginners! It is the opposite of pay yourself first! But it is absolutely the easiest way, even if not the best. I just read the rest of the comments, and it sounds like this is not that different than cash flowing them, which other good PFers do. I’m just not 100% convinced I could cash flow, in a single month, multiple big things. So we essentially cash flow, but have a savings account buffer to help smooth things from month to month. This is what we did in grad school after paying off DH’s debt. It worked pretty well. We ended up with fully funded iras and 50k for a house down payment. I think this is a great way to do personal finance for non-beginners who aren’t very detail oriented! I actually tend to “spend first” in that I set aside the amount needed for spending that month and then save the rest. That only works because I save a good chunk of my income though. We now have a balance in our checking account to cash flow irregular expenses and also have a short-term savings account in case our expenses get ahead of our income. I think this system is fine with high cash flow and experience, but I couldn’t have done it during grad school! I kept freaking out about even small vacations for ages, til Tim demanded that I start putting a little bit aside each month. That really did help me spend without feeling guilty for lowering savings. Now it’s just the rest of the irregular expenses that do. I like using targeted savings for planned purchases as well as irregular expenses. I agree that it alleviates guilt/enhances enjoyment! No, we don’t want to return to that model right now. 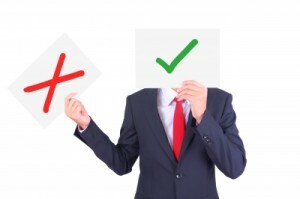 We do have one separate account but don’t want to draw on it when we could cash flow these expenses. We probably don’t need to be cash flowing so much because we have so much cash around… Ugh we need to get more organized with a proper EF!